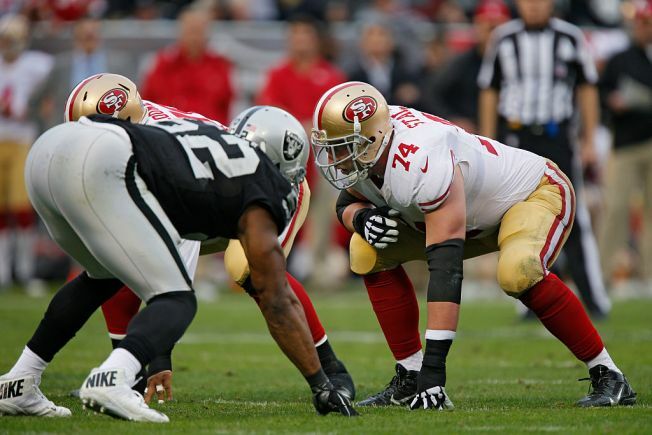 As the 49ers move forward with a rebuilding program that includes an influx of young talent, Joe Staley is the outlier. The veteran left tackle – who will turn 35 in late August – remains a crucial part of the offense, even entering his 13th NFL season. He may not be as good as he was at the peak of his career, but the six-time Pro Bowler still ranks among the elite players at his position. Plus, Staley says he’s been energized since Kyle Shanahan became head coach and gave the franchise a new energy and level of creativity it hadn’t had since Jim Harbaugh came on board. Staley has called Shanahan a “next-level genius” who’s a great communicator and exciting to be around. With quarterback Jimmy Garoppolo returning off knee surgery, Staley will be the man protecting his blind side – which he’s done since 2007 when he was a first-round pick by San Francisco out of Central Michigan. In fact, Pezet notes that Staley has improved as he’s aged. From 2007 through 2011, these were his Pro Football Focus grades: overall play (79.5), run blocking (77.5) and pass blocking (75.8). Those grades improved to 94.2, 93.0 and 89.5 from 2012-2018. “Throughout his career, Staley has proven to be a well-balanced offensive lineman by excelling in both the passing and running game,” wrote Pezet. Pezet says Staley’s career grades are comparable to now-retired former Cleveland Browns left tackle Joe Thomas, considered to be a sure Pro Football Hall of Famer. Staley has played 166 games, while Thomas played 167. Staley’s overall grade of 92.8 is just behind Thomas’ mark of 95.1. And, while Thomas’ pass-block grade was higher (95.9 to 86.6), Staley has been the better run-blocker (92.4 to 89.9). Mike McGlinchey, the 49ers’ No. 1 pick a year ago and the team’s starter at right tackle in 2018, agrees. McGlinchey posted a story about Pro Football Focus’ evaluation of Staley this week, backing the assessment.